Thanks to everyone who weighed in on the Composer Cagematch! Seems to me that we can all carry on as before — but do keep in mind that I welcome comments and constructive criticism always, so feel free to let me know what you think, even if I haven’t asked. Maybe especially then. Additional thanks to Mahler for not wiping the floor too hard with Wagner. You pile on too much Wagner, the floor gets slippery. Guess my dad never voted. This round of Composer Cagematch! was suggested by the super cool and very hip Chris McGovern. And thank God he did, because I couldn’t settle on an Italian match up for the life of me. I very nearly tossed in every Italian opera composer I could find in together and let them sort it out, but luckily a cooler head prevailed. Plus, all complaints may now be directed to him! One practically started opera. One continued opera as hard as he could. Falstaff. Macbeth. Aida. Or — The Coronation of Poppea. L’Orfeo. The Return of Ulysses. Good luck. * Because of Orpheus, see, and… shut up. Very awesome and sweet words, Jenn! I don’t really think I’m much of a hipster, but thanks so much for the thoughts! As for the cagematch, I go with Verdi for the classics. 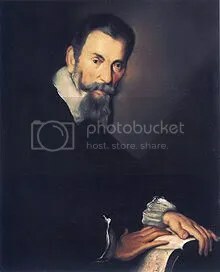 I love that there was somebody like Monteverdi to lay the groundwork for the art-form, but being he’s from the renaissance period of music that pre-dates Bach, I would say there was much more time to come before we had music with more dramatic weight, and Verdi came at the right time for that. BachAndByte: @aintbaroque Are we going to compare Bach & Offenbach, Berg & Schoenberg .. think there are more but mostly obscure? aintbaroque: @BachAndByte Haha, that would be fun! Kinda unfair for Offenbach, though. Unless we did WF or CPE. Or PDQ! Schoenberg and Berg, though — that just might be crazy enough to work. The Age of Awesome Facial Hair. 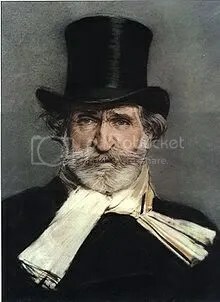 To say nothing of Verdi’s awesome hat. They still sell those don’t they? Someone needs to make the top hat hip again!